Your living room is an absolute place with the role to impress. It is the lounge made for you and your guests -- the one area that summarises the entire atmosphere of the house. Simply put, the living room plays a big deal in creating a perception to your guests. We certainly love it when a living room captures our attention and we’re about to show you some tips and tricks to make yours captivating. So read on. Every space deserves an attention-seeking spot, one that becomes the wild and wow-factor of the room to keep the viewers amazed. Known as a focal point, your living room should have one too. It will become the accent piece that will make the space interesting. The focal point can be of anything; the coffee table, the console, or even your TV cabinet. This is the masterpiece of the living area, one with the most design and materials displayed. Once you’ve made up your mind on it, selecting the furnitures and objects that complement one another will be much, much easier. Colour greatly defines the identity of a space -- it is the soul of the space. You’ve seen the neutral palette taking over many home interiors today and that may leave you curious for now. Well, neutral is timeless and never ages a day old! 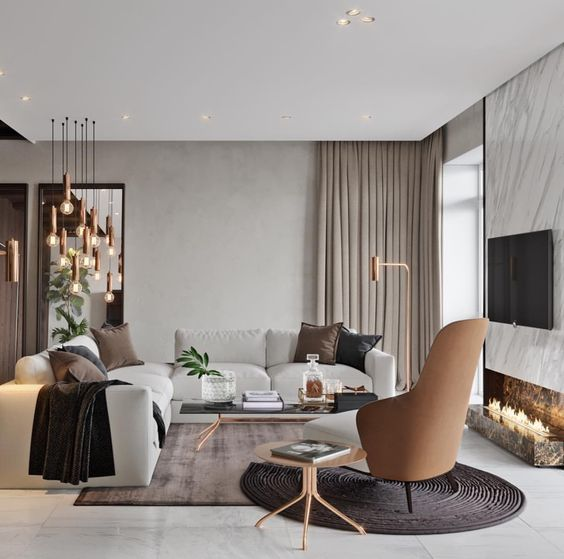 Going for the Earthy and ecru hues will certainly make your living room looking expensive and classy, not to mention making your hang out haven looking a lot more spacious too! Alternative to the wall paints, you could always go for the chic wallpapers with subtle patterns and textures for a little bit of glam! 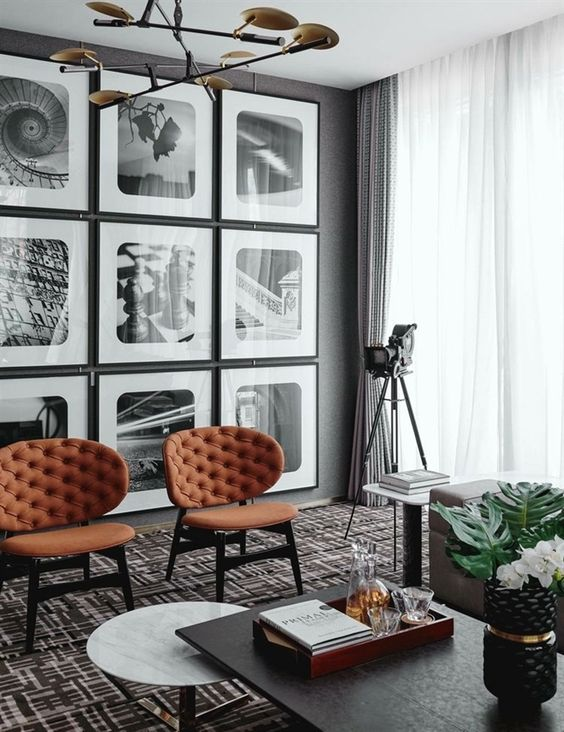 What’s a better interior accent than a feature wall? Displayed with a bold and rich palette, the feature wall should be a centrepiece of your home. Simply leave a wall with a contrasting paint colour or clad it with a different material. Complement the wall with a fancy armchair or a lavish console table to blend the feature with a more homely vibe. Add on indoor plants with the look to elevate the space with a gist of nature. Be creative, every personal touch matters! We all want a big living room. Who doesn’t anyway? If your space isn’t enough, worry not because mirrors will always save the day. They are an ultimate help when it comes to creating dimensions to give a larger perspective to the viewers, due to their reflective property. This in turn would make the room to appear more spacious than it actually is! Less is more. True – such expression means well when it comes to interior design. If you intend to show a luxurious demeanour in your living room, a minimal amount of items should be displayed, as to not make the interior to appear ‘busy’ and cluttered. Selecting the right furnitures to go with your interior is one thing, but putting the space together is another. Going minimal with loose furnitures would not only give off a glimpse of wealth appeal, it will also add on a touch of timelessness, if you’re thinking of giving your guests a perception of the elegant lifestyle! Lighting is an essential interior element that creates the mood of a space. Here’s the trick: The warmer lighting hue depicts a more intimate atmosphere that can easily bond the people together whereas a cooler hue portrays an active and productive ambience to inhibit a fresher vibe amongst the people. Tossing in a little bit of wow into your living room would be the perfect finish and natural elements would just do the job. Deemed as an exclusive material, these natural elements are naturally pleasing to the eyes. They are sustainable and everlasting -- they’ll never go out of style! 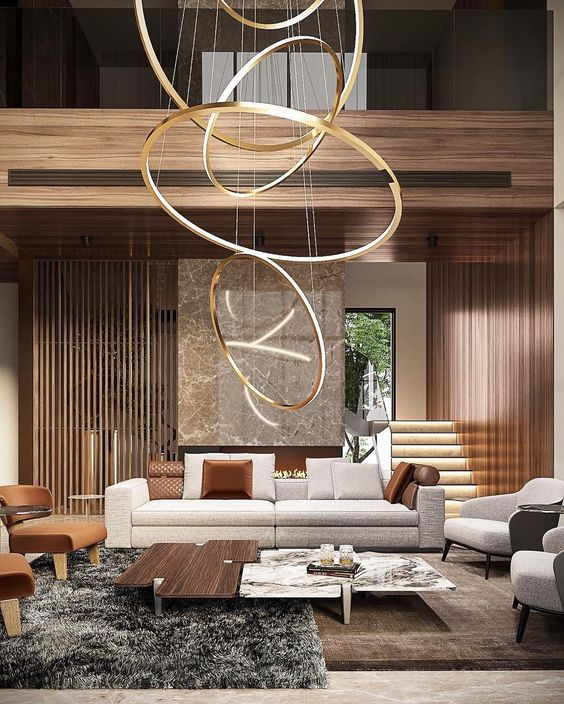 The natural elements like leather couch, wooden wall paneling, marble flooring, natural lighting through full-height glass wall, and many more never ceased to steal anyone’s attention. With this being said, the natural elements would never disappoint when it comes to making your living room an ultimate showstopper! Your living room is indeed an absolute place with the role to impress. Made for you and your guests, it surely deserves to be a wow factor in your home. Get yourselves ready folks, because we’ve got a lot of work to do!